Amid Contentious Inquiry, Morton Sees "Road to Accountability"
Exoneree Michael Morton says the sometimes painful court process examining his wrongful conviction is part of a journey he is on to find accountability and promote reform in the criminal justice system. 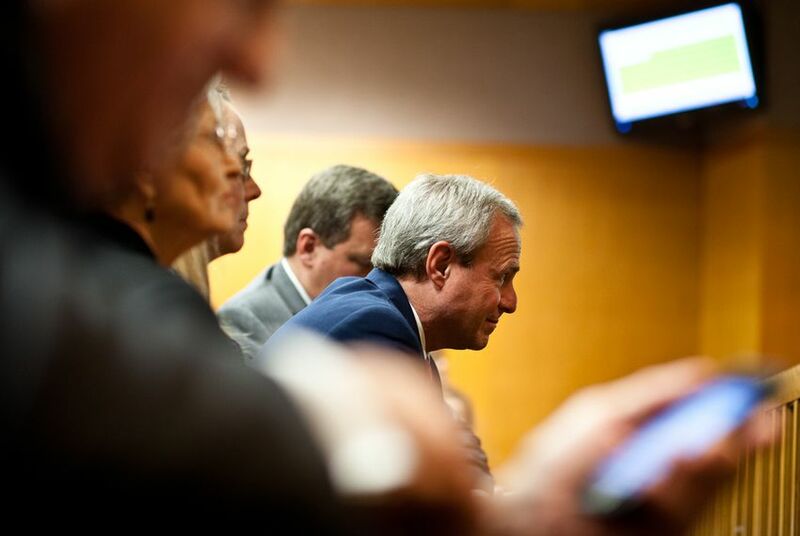 GEORGETOWN — It’s been a painful week at times, Michael Morton said, as a court of inquiry rehashes the details of the botched murder trial that led to his wrongful conviction more than a quarter-century ago. “Sometimes you get angry, sometimes you get a little sad, sometimes you get a little numb from sitting through it all,” he said after 10-hour day of contentious courtroom testimony Wednesday. But, Morton said, the pain, sadness and anger are just part of the journey he is on to find some accountability for the prosecutor who sent him to prison for life for a murder he did not commit. “This is something I really feel needs to be done, not so Ken Anderson can be drawn and quartered, but this is a road to accountability,” Morton said. Anderson, the prosecutor who oversaw Morton’s conviction, is the subject of a court of inquiry charged with determining whether he committed criminal violations during the prosecution. Anderson contends he committed no wrongdoing in the case. On Wednesday, the third day of the court of inquiry, Rusty Hardin, the appointed attorney pro tem, attempted to show that the former prosecutor went to great lengths in Morton’s 1987 murder trial to keep information from the lawyers who were trying to defend him. Attorneys for Anderson worked to show that defense lawyers did a poor job of chasing down the evidence that should have been available to them. They also sought to prove that the judge in the case ordered Anderson to provide only one report to the court, and he did that. In some of the most dramatic testimony of the day, Hardin read from a pre-trial transcript an argument between Anderson and defense lawyers in 1987. The reading came during questioning of County Court at Law Judge Doug Arnold, a former prosecutor who worked under Anderson. Arnold said he had considered Anderson an ethical prosecutor, and he asked his former boss to swear him in when he became a judge in 2010. In the passage Hardin read, Anderson told Judge William Lott that he would rather strike his own witness than give the defense lawyers notes he would have to turn over if she testified. As Hardin read through the court exchange, some of the lawyers in the courtroom audience gasped, seemingly taken aback by the extent to which Anderson appeared to go to keep information from Morton's defense team. Hardin harkened to a statement that Anderson had made repeatedly in a deposition last year, that there was "no way on God's green earth" he wouldn't have shared with the defense team information that pointed to Morton's innocence. "Is that fair on God’s green earth?” Hardin asked Arnold. Under questioning from Hardin, Bill White and Bill Allison — Morton’s trial lawyers — said Anderson turned over precious little information to them despite their requests. They also said that contrary to Anderson’s statements, the prosecutor did not tell them about critical evidence, either. “It was sort of a no discovery case,” White said. Among the items of evidence Anderson is alleged to have deliberately withheld is a transcript of a conversation in which Morton’s mother-in-law tells a sheriff’s deputy that the couple’s 3-year-old son saw a monster kill his mother. The boy said his father wasn’t home. Morton’s lawyers also argue that Anderson withheld a police report in which neighbors reported seeing a man in a green van who appeared to case the family’s home. Those two items of evidence, Allison and White said, would have been critical to bolstering their theory — which eventually proved true — that a stranger had entered the home and killed Christine Morton. The evidence would have helped to explain unidentified fingerprints in the Mortons’ home and an unidentified footprint in the backyard. Allison said that although he and White knew that young Eric had seen a stranger in the home on the morning of the murder, they did not know about the transcript of the conversation between Morton’s mother-in-law and Williamson County Sheriff’s Department Sgt. Don Wood. They couldn’t put a 3-year-old on the stand to prove his father’s alibi, because they worried jurors would be disgusted by that strategy. But the lawyers said that if they had known about the phone call transcript, they would have fought to allow jurors to see it. “It was a critical piece of evidence when I look at it 25 years later,” Allison said. Knox Fitzpatrick, one of Anderson’s lawyers, attempted to show, through a line of questions to White, that Morton's defense lawyers did not adequately seek out evidence that was available to them. He asked White why he didn't interview Morton's son, Eric, after his client told him that the boy had seen a man with a big belly in the shower with a blue-purple shirt. And he asked why they didn't ask family members or the boy's therapist about what he had said. "We made the decision that we weren’t going to put on a 3-year-old in this kind of case," White said. "We thought it was just bad, bad tactics." During questioning of Allison, Eric Nichols, another lawyer for Anderson, argued strenuously that the judge overseeing the 1987 case had ordered Anderson to only turn over a single report from the day of the murder. Allison told Nichols that he couldn’t produce a written order from Judge Lott that would have required Anderson to turn over all the reports from the lead investigator in the case. And that is a key question in the case — whether Anderson violated a judge’s order to turn over evidence. Morton, who has been watching the proceedings from the courtroom’s front row next to his fiancé and his mother, said he hopes that lawmakers in Austin are paying careful attention to the court of inquiry and the lessons learned from his case. Below, we continue the liveblog of the court of inquiry proceedings. Click here to read details from the first three days of the hearings. Click on the PDF to the left to view the cast of characters and orient yourself to the proceedings. On Thursday, court action will resume with testimony from Allison. The most emotional testimony of the day so far came as Hardin asked Allison how he felt about Morton's conviction over the last 25 years until his exoneration in 2011. The aging lawyer with gray, curly hair and a large silver mustache teared up as he responded. "At the end of the day, what was your belief that you lived with for 25 years before we got here in terms of the conviction of Michael Morton?" Hardin asked. "That an innocent man had been convicted and his son taken away from him by the state, and it was just something I had an obligation as Michael's original lawyer to pursue as best I could. "I think that when he was exonerated in October 2011 that most of my job on this case was really done. He was out and free, and through John Raley, reunited with Eric. "I just, it was a long, grueling cycle for me. It was absolutely terrifying for Michael and his family. It's hard to explain how I feel. I had felt for a really long time that maybe I had really let Michael down somehow." Allison took off his wire-rimmed glasses to wipe his eyes with tissue. Nichols brings out a folder full of Judge Lott's trial notes from the Morton case. On the screen in the courtroom is a sheet of paper dated Nov. 26, 1986 with hand-scrawled notes. The notes are about a hearing on a defense motion to suppress Morton's statements to investigators on the day of his wife's murder. The judge noted that Sgt. Don Wood didn't have a "good memory" of what happened that day. A note by the judge in the margin of the paper says the judge asked for a copy of Wood's "report to be forwarded to court for in camera inspection … and field notes he took." Since there is no specific written order from the judge in which he orders Anderson to submit investigators' reports and Lott died in 2009, Nichols says, this court must now interpret what he wanted back in 1987. Nichols contends Lott would have known that the few pieces of paper Anderson submitted to the judge for in camera inspection were not the entire investigative report of Wood. If Lott had wanted all of the investigative reports — not just the reports from one day — surely, Nichols suggests, the experienced jurist would have demanded Anderson give him more. "Are you seriously suggesting to this court that Judge William Lott with the experience he had in law enforcement as a judge would ever conclude that a few pieces of paper folded over was the complete file on the Christine Morton investigation?" Nichols asked Allison incredulously. After another similarly phrased question, Allison replied, "I don’t know what was in Judge Lott’s mind." Nichols tells Allison that the transcript of the conversation between Rita Kirkpatrick and Sgt. Don Wood about Eric seeing a monster kill is mother and the police report about neighbors seeing a green van in the Morton's neighborhood having nothing to do "top side or bottom" with what Lott ordered Anderson to turn over. The order, he says, was only for Wood's reports of what statements Morton made in his home on Aug. 13, 1986, the day of the murder. "As long as you interpret [the order] that way, that is correct," Allison responded. Continuing his questions of Allison, now Nichols seems to be attempting to show that the defense of Morton in 1987 was inadequate. He started by asking Allison whether he realized that Morton, shortly after he was convicted, could have made claims of ineffective assistance at his trial and if that was the reason he decided not to continue representing Morton and handed the case over to the Innocence Project. Nichols asked about whether Allison and White demanded that Sheriff Boutwell turn over his investigative file in response to a subpoena the defense filed. The implication is that they could have asked for it under the Gaskin rule when Boutwell testified during the trial. "Sounds like we didn’t," Allison said. Allison is still on the stand, and Nichols is trying to raise questions about the credibility of the lawyer recalls from the trial 25 years ago. Nichols reads from draft of affidavit where Allison says he doesn’t have an independent memory that assistant district attorney Mike Davis’ made comments to jurors after the trial indicating that Sgt. Wood had a large file of investigative documents that would have raised doubt in their minds about Morton's guilt. Then, Nichols puts up the affidavit Allison submitted to the court, in which he says that Davis told the jury that Sgt. Wood's reports were sizable and could have raised reasonable doubt. Nichols is suggesting that lawyers working with the Innocence Project twisted Allison's memory to make their case against Anderson, and he begins raising his voice when Allison makes mistakes in his testimony about the evidence in the case. Rusty Hardin stands, and in a calm tone asks the judge to insist that Nichols not yell at Allison and that he be cognizant of the trying circumstances under which the lawyer whose client was wrongfully convicted is testifying. "I would like to suggest to the court that the Innocence Project is not on trial here," Rusty Hardin says. Nichols says he is appreciative of the work the organization does to free innocent people, and then adds, "I'm less appreciative of the work that's being done here." Hardin is now attempting to salvage Allison's testimony after Nichols raised doubts about his credibility. Allison explains that it's difficult to have a memory of things that did not happen. "How does one have a specific memory of that which did not happen," he says to Hardin. In his jovial way, Hardin brings levity to the room and asks Allison, a law professor, to stop being quite so esoteric about his answers to the questions. "Would you agree with me that you’re a very literal man," Hardin asks. Allison responds, "People accuse me of that, yes," and the audience giggles. Hardin walks to the front of the room to an easel with a large white paper pad. With a black marker he writes "Things You Are Certain About." He asks Allison whether he is certain that Anderson never told him about the Kirkpatrick transcript. Allison agrees, and he writes that on the white board. He continues, asking about the green van report and the allegedly stolen credit cards, and Allison agrees he wasn't aware of those things at the trial. We're back from a lunch break. Taking the stand is Mark Landrum, who was jury foreman during Morton's trial in 1987. He's 52, works at Dell, lives in Round Rock. Under questioning from Derek Hollingsworth, Landrum explains that the jurors decision about Morton's guilt rested largely on testimony from Dr. Bayardo, the medical examiner who placed Christine Morton's time of death in the wee morning hours when only her husband would have been at home. He based that conclusion — which has since been challenged — on the condition of the contents in Christine Morton's stomach. While Morton's lawyers argued that an intruder could have committed the crime, Landrum said that they didn't have the evidence on which to base that conclusion. "The challenge was although they had these hyposthesis and these potentials … they didn’t have any facts to hang those on," Landrum said. "So when Mr. Anderson came up to do his closing arguments, he said, 'That’s all very interesting, but here are the facts.'" After that, he said, Morton's lawyers didn’t have anything to hang their theories on. Hollingsworth shows Landrum the green van report and the Kirkpatrick report and asks whether those items would have been material to the jurors' deliberation. He particularly discussed the transcript that details Eric's observations of the murder. "Regardless of what Michael was presented as, I never in a million years would have thought he would have done that in front of his son," Landrum said. Hollingsworth asked whether those items would have been helpful to jurors in their deliberations. "It would have been very helpful," Landrum said. "I wish I would have been given the opportunity to know this when we were making our decision." Landrum says when assistant DA Mike Davis told jurors after the trial that prosecutors had more evidence, he thought at the time that Davis meant that they had more evidence of Morton's guilt. Davis, he said, gave an example that a neighbor said the light was on in the middle of the night. Landrum said that gave him a mental picture of Morton cleaning himself up after the crime and making it look like a robbery scene. "I felt better knowing that they potentially had more evidence," Landrum said. The next time Landrum said he heard about the Morton case was when a reporter called him asking about DNA evidence that might indicate he had helped convict an innocent man. He called then-district attorney John Bradley and asked whether the jury had in fact convicted an innocent man. "'Michael is a desperate man grasping at straws,'” he said was Bradley's response. Hardin has wrapped up his presentation of evidence. Now the lawyers are discussing why some witnesses are not available to testify. Lott and Boutwell are deceased. Wood has had a number of strokes and has trouble with memory. Kirkpatrick did not want to testify and has fragile health. But Kirkpatrick, Morton's mother in law, submitted a note dated Jan. 25, 2013, about Anderson, which was read in court. "My memory is not very clear of that nightmarish time. "What I do remember clearly is that Ken Anderson was a fine, dedicated young man who was always kind and considerate to me and my family. As to our now "famous story" I feel it was greatly embellished and not credible - with me asking leading questions of my 3 years plus 2 months old grandson. "We were searching and hoping for answers." Hardin says that at the end of the court proceedings, he plans to suggest that the court take the evidence for review. He will suggest that both he and Anderson's lawyers submit briefs in the intervening time before Judge Sturns then brings the lawyers back for oral argument and then issues a decision. We're on a break after a tense exchange between Nichols and Hardin. Anderson's lawyers want to keep out the deposition of Sgt. Wood, arguing that he was too ill to give it in 2011 and suffering from dementia. "I do find it fairly ironic," Hardin said. "Once again, we are talking about excluding from the light of day relevant testimony in the case of a man wrongly convicted for 25 years." Nichols slammed his hand loudly on the table and demanded that the judge stop Hardin's constant speeches and advocacy. Sturns overrule and asked Hardin if he would like to continue. "I'd love to continue as long as I get that kind of response," Hardin said jokingly, causing the audience to erupt in laughter and Nichols to launch on a speech saying that this is precisely why courts of inquiry have been criticized as "political circuses." "These constant speeches, the playing to the cameras" he railed, "is not what a court of inquiry is supposed to be." Former district attorney John Bradley, Anderson's successor, takes the stand. Interesting factoid: Rusty Hardin and John Bradley worked in the Harris County district attorneys office at the same time earlier in their careers. On the stand, Bradley recalled that when he was there Hardin was one of the department chiefs. Bradley, under questioning from Nichols, says he has more closely reviewed the record in this case since he signed an affidavit indicating he believed Judge Lott ordered Anderson to turn over investigative files. He said the affidavit was prepared by Barry Scheck, of the Innocence Project. "They were Mr. Scheck's word choices," he said, adding, "They were more or less my feelings at time." Since then, he said he has read Lott's notes and compared it to the record in the case and concluded there was no such order. "If there's no court order, then can be no crime," Bradley said. He went on to say that the affidavit was "correct" but not entirely "accurate." "I didn’t have a lot of control over this," the longtime DA and former Texas Forensic Science Commission chairman known for his hard-nosed approach, said. "It was going to be his statement not mine." One of the items in the affidavit that Bradley said he objected to was a portion that indicated he relied on Anderson in making decisions about responding to post-conviction litigation in Morton's case. "It's sort of implying that I was a puppet and this other person was feeding me lies," Bradley said. "Has anybody ever accused you of being puppet," Hardin asked. "They have not," Bradley said. "I'm not concerned about people's opinion of me. I was concerned about the sort of impression that creates in a case where we’re supposed to be dealing with factual information." Hardin later asked Bradley about his own reaction to the discovery of DNA evidence that showed Morton's innocence. He described it as a "sobering moment." Then Hardin asked Bradley whether Anderson, whom he had described as a man of few words, had a similarly sobering response. "Given what I know about his personality, I would say yes," Bradley said. "He came slower to the realization than I did, but I was closer to the facts." The temperature of the exchange between Hardin and Bradley, seasoned litigators, got a little amped up. Hardin is going point-by-point through Bradley's affidavit to see where he's changed his mind and why. They got stuck on one paragraph in which Bradley indicated that Anderson should have responded to Morton's claims in 1992 that the prosecutor violated Brady by withholding evidence. Bradley says now that that's "a leap" to impute bad motives to Anderson's lack of response. Prosecutors, he said, regularly decline to respond to such post-conviction inmate claims. He said that he no longer believes what he said in the affidavit is accurate after a more careful review of the record in the case. Judge Sturns asked them to lower their voices, which were rising in the exchange. "This is the third time you’ve read that paragraph," Bradley said, clearly exasperated. "I'm familiar with it." "You are not the district attorney. You are a witness," Hardin said, reminding Bradley that he lost his election last year, in a campaign that focused on his role in opposing Morton's DNA testing. Nichols asks Bradley about his impression of Anderson after working with him for decades. "Mr. Anderson had very high ethical standards," Bradley said, adding that his former boss tried to integrate his Christian beliefs into his work. "The decisions I saw him make were always highly ethical." Nichols then asks about Judge Lott, and Bradley described him as "meticulous," keeping detailed notes that he would refer to and use to correct lawyers during court proceedings. "He was very precise on the law in his orders," Bradley said. That is why, Bradley explained, he changed his opinion about what Lott had ordered and what Anderson was required to turn over in the Morton case after reading the judge's notes and comparing them to the record. And he now believes Anderson's contention that Lott only ordered the prosecutor to turn over statements that Morton made the day of his wife's murder. Court proceedings are over for the day. Sturns says that we will reconvene at 8 a.m. tomorrow and the lawyers have said they can finish up by noon. That last bit generated some snickers in the room.